Thinking Out Loud In Sturbridge: Worth The Thought? Our selectmen voted not to fund a school resource officer for Tantasqua Regional High School last spring. If the school committee would like one, then they can hire one, and pay for the officer from their funds. In fact, since, the regional school is a school representing five area towns, the towns could all do their part in funding an officer. I do not believe the vote last May by our selectmen was a vote against the concept of a SRO, but rather against the funding of one. Nationally, the need for an SRO has been shown to be there, and for schools as large as TRHS, it is almost a requirement. Like any small village, that hires a constable, or has single police officer, and TRHS's population is like that of a small village, there is a need for an SRO in that community. Why is this concept so difficult to overcome? In 2009 or 2010, the School Committee conducted an in-house study to see if a SRO was needed. They concluded that one was not needed because there are stopgaps and other measures already in place. Also, the school committee has voted against hiring an SRO. The majority of selectmen support the concept of an SRO. But as you have pointed out, Wally, all the towns could pay for it if those towns felt it was required, or it should come out of the school budget. Didn't "we" vote to fund the SRO at town meeting? It was passed along with everything else i thought. I remember there was an attempt to revisit it buy the funny guy who gets up on occasion but the request was denied by the moderator. What is the current status of the SRO? The Town Meeting did adopt a police budget which included money for the SRO. A voter arrived late, after the vote and wanted to reconsider the vote because he had missed the chance to speak against it. As moderator, I felt this was an insufficient reason for reconsideration and did not allow it. I do not know what happened after the Meeting. Questions about what happened since might best be directed to the Tantasqua School Committee, the Town Administrator or Chief Ford. So i see that Burgess has a SRO now. I'm sure there is some sorta benefit to having a cop at an elementary school but i can't figure out what it is. Are they breaking up a major gambling ring, playing for miniature snickers or something? Halloween is right around the corner... I went to elementary school in NYC and we did not have a cop at the school, there was a security guard. My high school did have a liaison with the local PD and he was at the school frequently. 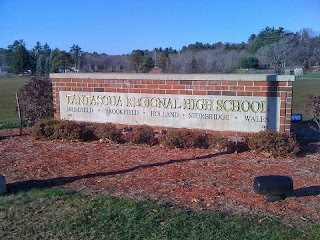 It was about the same size as Tantasqua. I can see it in a high school but nothing lower than that. In my opinion the SRO should not be at Burgess just because it was funded. I would like to have seen the SRO position put on hold until the high school agreed they needed one. I am feeling that this is a poor use of my tax dollars. I may be mistaken, perhaps there is a great need for a SRO at Burgess but i am clouded by my opinion, it would not be the first time. Let The Heating Games Begin!